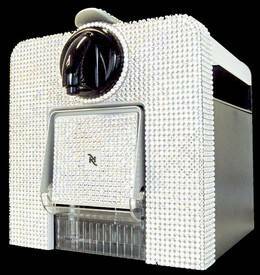 Adourned with 3100 original Swarovski-crystals complete in the colour crystal, this ugly Nespresso Crystal Edition coffee machine cost you ?1,995 ( 3,983 U.S. dollars). What else I can tell… expensive coffee. – automatic funktions. Choose with one push at a button between Espresso and Lungo. © 2019 Gadget Guide. All Rights Reserved.